It's another quiet release week on the gaming front, but one of the games that managed to survive the downfall of THQ offers a light in the dark - the sequel to surprise hit Metro 2033, Metro: Last Light. Lets talk shop about games, post apocalyptic or otherwise, in this week's Tuesday Game Room! I'm still conflicted about continuing on in my Fire Emblem: Awakening playthrough. I really enjoy the game, but the tension Permadeath provides is emotionally exhausting me every time there's an encounter, and it gets pretty relentless. I'm probably going to break and restart on the 'Casual' mode with Permadeath off, because I'm really enjoying the strategic aspect of the game as well as the interesting story and gorgeous visuals. Don't care if that makes me a wuss, but dammit, I'd like to play without freaking out about my dearests Miriel and Lon'qu not dying! As I said up top, it's a slight week. 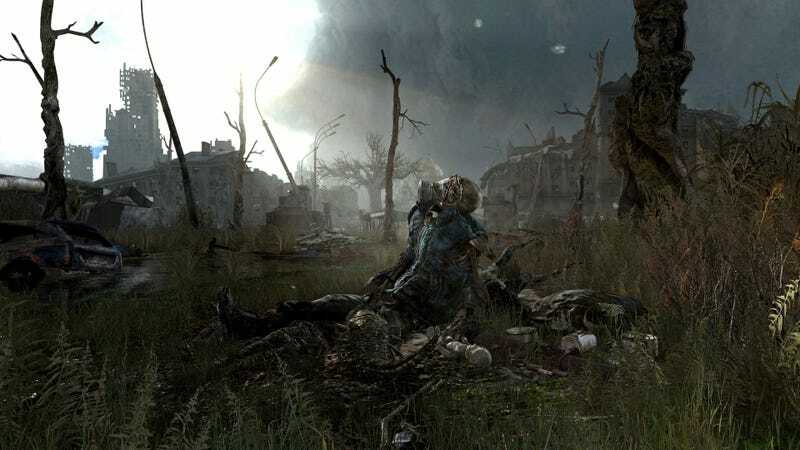 The big name release is Metro: Last Light, the sequel to the super-interesting post-apocalypse FPS Metro 2033, from Ukranian developer 4A games. It's had a troubled release thanks to the decline of THQ, but you can see if that affected the end product this Tuesday. Apart from that... hoo boy. The controversial Rockstar classic Manhunt hits PSN, and Megaman 5 makes its way to the Nintendo eShop. That's pretty much it. Games stopped coming out, you guys! We had a crazy run of big name games, but that well's a bit dry at the moment. Pokémon X/Y is set in PokéFrance - it apparently has mountable Pokémon (oi, no dirty thoughts on that one) too, but that's nothing compared to PokéFrance! Sacre Bleu! EA hits the Wii U hard as it struggles to run Frostbite 3 - Losing a whole host of future titles like the next Battlefield, as well as future Mass Effect and Dragon Age games, is a real knock to the Wii U's attempt to re-establish Nintendo's relationship with 3rd party console developers, and is just another knock in the console's short and troubled history. Patrice Désilets, the man behind Assasin's Creed, is fired from Ubisoft (after quitting 3 years ago!) - Hot damn, Patrice! You're back for two weeks after the THQ assest buy up, and now you're gone again? Rumours were that he was less than pleased about the annualisation of the AC franchise after Brotherhood, so with AC IV due out this year maybe that could be responsible for this second departure. He's an awesome dude (and owner of an awesome beard), I hope he finds work somewhere soon. EA will not license real-world weaponry for its video games this year - In response to their godawfully disgusting Medal of Honor marketing stunts last year? No, that would be sensible! Because Books don't have to pay, that's why. I'm not usually one to jump on the EA hate, but good lord, they make it so hard not to, pulling idiocy like this.